The Cisco DX80 takes collaboration to a new level with award-winning design, expanded capabilities, and value-based pricing to scale to every desktop in every organization. Discover a delightful new approach to working that is simple to use and offers everything you need to be productive in one sleek, integrated, desktop device. The Cisco DX80 offers best in class HD video and audio, and extensive UC features, Android applications and email. 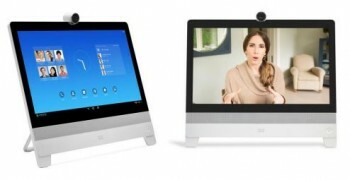 VideoCentric, the UK’s Premier Cisco Partner, can provide the Cisco DX80 as a standalone device, or integrated with Cisco Spark or Cisco VCS/CUCM. We can provide quotations, integration services, maintenance, installation, demonstrations and hire of the Cisco DX80 device, or other integrated solutions for your executive desktop or huddle spaces. Looking to Hire the DX80? The Cisco DX80, part of the DX Series desktop collaboration line within the Cisco portfolio of collaboration endpoints, provides an Android based solution that gives access to fully integrated Android applications, including Cisco WebEx & Cisco Jabber. The Cisco DX80 offers award winning design and a multi-touch touchscreen capabilities with easy-to-use on-screen navigations. Looking for something a little smaller? Take a look at the Cisco DX70 and the Cisco DX650 for smaller Android based Cisco desktop devices. Security Enhanced Android Operating System combined with Cisco end-to-end security features gives peace of mind to network administrators. Cisco Extension Mobility supports multiple profiles, allowing hot-desking and shared workspaces. Native Cisco AnyConnect VPN makes connecting to the workplace from the home office quick and easy. Personalize your experience and increase productivity with options to customize wallpaper, widgets, and screen layouts. Use a variety of Bluetooth and USB accessories. Looking to Hire the C40?